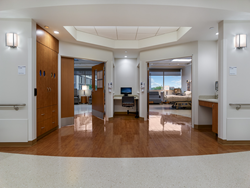 Gilbane Building Company was recently honored by ENR Midwest with the Best Healthcare Project award for the 3rd and 4th Floor Patient Room Build-out at The University of Chicago Medicine. The 204,000 SF build-out project converted vacant space into patient floors with a total of 203 new beds. Scope of work also included support work in multiple mechanical spaces to provide new equipment and four new air handling units. The patient rooms included 92 med-surg rooms, 37 observation rooms, 56 ICU rooms and 18 isolation rooms. The 3rd floor build-out also included a burn unit, while the 4th floor included a radial lounge, PT/OT suite, and procedure room for the Heart and Vascular Department. Gilbane delivered this complex project two months ahead of schedule. This monumental achievement was accomplished utilizing Lean practices, Advanced Planning and Scheduling, prefabrication, and leading-edge technology. The project team was committed to making a difference in the local community. This project created significant job opportunities including 560 union jobs (267 minority and female) and 36% City of Chicago residents. The project also achieved 45.70% diverse participation. ENR Midwest will honor all Best Project winners at an awards breakfast at the Westin Chicago River North on November 29th. Gilbane has two permanent offices located in Chicago, as well as an extensive knowledge of the Chicagoland market including construction processes, area subcontractors/suppliers, local M/WBE contractors, and familiarity with Chicago jurisdictional authorities. With 39 years of success in the highly competitive Chicagoland market, Gilbane is committed to continuing the strong tradition of excellence in the Chicago construction industry.